احمدی, فرشاد, رادمنش, فریدون, میرعباسی نجف آبادی, رسول, آیشم, سجاد. (1394). پیش‌بینی تبخیر و تعرق ماهانه گیاه مرجع در شمال‌غرب کشور با استفاده از برنامه‌ریزی ‌ژنتیک و ماشین بردار پشتیبان. نشریه آبیاری و زهکشی ایران, 9(1), 54-65. فرشاد احمدی; فریدون رادمنش; رسول میرعباسی نجف آبادی; سجاد آیشم. "پیش‌بینی تبخیر و تعرق ماهانه گیاه مرجع در شمال‌غرب کشور با استفاده از برنامه‌ریزی ‌ژنتیک و ماشین بردار پشتیبان". نشریه آبیاری و زهکشی ایران, 9, 1, 1394, 54-65. احمدی, فرشاد, رادمنش, فریدون, میرعباسی نجف آبادی, رسول, آیشم, سجاد. (1394). 'پیش‌بینی تبخیر و تعرق ماهانه گیاه مرجع در شمال‌غرب کشور با استفاده از برنامه‌ریزی ‌ژنتیک و ماشین بردار پشتیبان', نشریه آبیاری و زهکشی ایران, 9(1), pp. 54-65. احمدی, فرشاد, رادمنش, فریدون, میرعباسی نجف آبادی, رسول, آیشم, سجاد. پیش‌بینی تبخیر و تعرق ماهانه گیاه مرجع در شمال‌غرب کشور با استفاده از برنامه‌ریزی ‌ژنتیک و ماشین بردار پشتیبان. نشریه آبیاری و زهکشی ایران, 1394; 9(1): 54-65. در مطالعه حاضر به­منظور تخمین تبخیر- تعرق گیاه مرجع با استفاده از دو مدل ماشین بردار پشتیبان (SVM) و برنامه­ریزی ژنتیک (GP) در مقیاس زمانی ماهانه، 6 ایستگاه سینوپتیک در منطقه شمال­غرب کشور در دوره آماری 38 ساله (2010-1973) انتخاب گردید. در ابتدا مقادیر تبخیر- تعرق مرجع ماهانه برای ایستگاه­های منتخب توسط روش فائو- پنمن- مانتیث محاسبه و به عنوان خروجی مدل­های SVM و GP در نظر گرفته شد. سپس یک رابطه رگرسیونی بین متغیرهای اقلیمی مختلف مؤثر در پدیده تبخیر- تعرق به­دست آمده و الگوهای مختلف ورودی برای مدل­های مورد استفاده مشخص شد که بر این اساس رطوبت نسبی با داشتن کم­ترین اثر از ورودی­ها حذف گردید. هم­چنین در مطالعه حاضر، به منظور بررسی اثر حافظه در پیش­بینی تبخیر- تعرق از گام­های زمانی (تاخیر) یک، دو، سه، چهار و پنج ماهه نیز به عنوان ورودی برای مدل­ها استفاده شد. به طور کلی، برای هر مدل 10 الگوی ورودی ایجاد گردید. هرچند نتایج حکایت از دقت بالا و خطای کم هر دو مدل در پیش­بینی تبخیر- تعرق مرجع ماهانه در شمال غرب ایران داشت، ولی کارایی مدل SVM به مراتب بهتر از مدل GP بود. هم­چنین نتایج مطالعه حاضر نشان داد که در صورت نبود اطلاعات هواشناسی کافی، می­توان از حافظه نیز در پیش­بینی تبخیر- تعرق گیاه مرجع استفاده کرد. In this study, for estimating grass reference crop evapotranspiration using support vector machine (SVM) and genetic programming (GP) techniques, monthly meteorological data of 6 synoptic stations in northwest of Iran during a 38 year period (1973-2010) were collected. At first, the monthly grass reference crop evapotranspiration values for selected station were calculated using the FAO-56 Penman-Monteith equation and considered as the output of SVM and GP models. In the next step, a regression equation was made based on effective climatic variables on evapotranspiration and different input patterns were defined for developing SVM and GP models. Since the relative humidity had the lowest effect on evapotranspiration, it was removed from the model’s input variables. In order to consider the effect of memory of time series in the accuracy of evapotranspiration prediction, the evapotranspiration values with one, two, three, four and five months lag time were used in model’s input patterns. Ten input patterns were made for every model. However, the obtained results showed the high accuracy of both SVM and GP models in predicting monthly grass reference crop evapotranspiration in northwest of Iran, but the SVM method had better performance than GP method. Also, the results showed that if there is no enough meteorological data, the memory of time series can be used for predicting monthly grass reference crop evapotranspiration. زارع ابیانه،ح.، قاسمی،ع.، بیات ورکشی،م.، محمدی،ک.، سبزیی­پرور،ع.ا. 1388. ارزیابی کارآیی دو نرم افزار شبکه عصبی مصنوعی در پیش­بینی تبخیر- تعرق گیاه مرجع. مجله دانش آب و خاک. 19.2: 212-201. زارع ابیانه،ح.، بیات ورکشی،م.، معروفی،ص. 1390. محاسبه تبخیر و تعرق واقعی گیاه سیر به روش مدل­سازی چندگانه تحت شرایط کاشت لایسیمتر. مجله پژوهش­های حفاظت آب و خاک. 18.2: 158- 141. ستاری،م.ت.، نهرین،ف.، عظیمی،و. 1392. 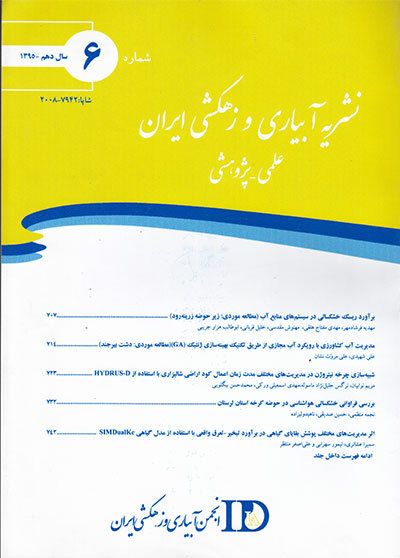 پیش­بینی تبخیر - تعرق مرجع روزانه با استفاده از مدل شبکه عصبی مصنوعی و مدل درختی M5 (مطالعه موردی: ایستگاه بناب). نشریه آبیاری و زهکشی ایران. 7.1: 113-104. Adamowski,J and Prasher,S.O. 2012. Comparison of machine learning methods for runoff forecasting in mountainous watersheds with limited data. Journal of Water and Land Development. 17.8: 89–97. Alvisi,S., Mascellani,G., Franchini,M and Bardossy,A. 2005. Water level forecasting through fuzzy logic and artificial neural network approaches. Hydrology and Earth System Sciences. 10.1: 1-17. Aytek,A and Kisi,O. 2008. A genetic programming approach to suspended sediment modeling. Journal of Hydrology.351.3: 288-298. Chen,S.T., Yu,P.S .2007. Real-time probabilistic forecasting of flood stages. Journal of Hydrology 340: 63-77. Dogan,E. 2009. Reference Evapotranspiration Estimation using adaptive neuro-fuzzy inference system, Journal of Irrigation and Drainage. 58.5: 617-628. Ferreira,C. 2001. Gene expression programming: a new adaptive algorithm for solving problems. Complex Systems. 13.6: 87-129. Ghorbani,M.A., Kisi,O and Aalinezhad,M. 2010. A probe into the chaotic nature of daily streamflow time series by correlation dimension and largest Lyapunov methods. Applied Mathematical Modelling. 34.12: 4050–4057. Guven,A. 2009. Linear genetic programming for time-series modeling of daily flow rate. Journal of Earth System Sciences. 118.2: 157-173. Hamel,L. 2009. Knowledge Discovery with Support Vector Machines. Hoboken, N.J. John Wiley. Jia Bing,C. 2004. Prediction of daily reference evapotranspiration using adaptive neurofuzzy inference system. Trans of the Chinese society of Agricultural Engineering. 20.4: 13-16. Karahan,H., Iplikci,S., Yasar,M and Gurarslan,G. 2014. River flow estimation from upstream flow records using support vector machines. Journal of Applied Mathematics. 1:1-7. Khu,S.T., Liong,S.Y., Babovic,V., Madsen,H and Muttil,N. 2001. Genetic programming and its application in real- time runoff forming. Journal of American Water Resources Association. 37 .2: 439-451. Koza,J.R. 1992. Genetic Programming: on the programming of computers by means of natural selection. Cambridge, MA: MIT Press. Pai,P.F and Hong,W.C. 2007. A recurrent support vector regression model in rainfall forecasting. Hydrological Process 21:819-827. Tabari,H., Martinez,C., Ezani,A and Hosseinzadeh Talaee,P. 2013. Applicability of support vector machines and adaptive neuro- fuzzy inference system for modeling potato crop evapotranspiration. Irrigation Sciences. 31.4: 575-588. Vapnik,V.N. 1998. Statistical Learning Theory. Wiley, New York. Yu,P.S., Chen,S.T., ChangI.F. 2005. Flood stage forecasting using support vector machines. Geophysical Research Abstracts.7 :41-76. Zahiri,A and Azamathulla,H.M.D. 2014. Comparison between linear genetic programming and M5 tree models to predict flow discharge in compound channels. Neural Computing and Applications. 24.2: 413–420.